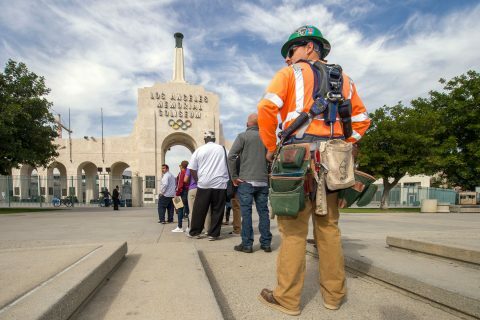 For almost a century, the Los Angeles Memorial Coliseum has been a crown jewel of South L.A. Now at the halfway point of a $270 million renovation, the legendary landmark is providing hundreds of jobs and has exceeded city and county goals for local worker participation. To ensure that workers reap the benefits of the renovation, Theodora Oyie served as a coordinator for community groups, unions and job seekers. Oyie is senior manager of community engagement for Hathaway Dinwiddie, the project’s managing general contractor. “We diligently reached out to engage the whole community to participate and to gain the benefits of meaningful careers that pay living wages with benefits,” she said. 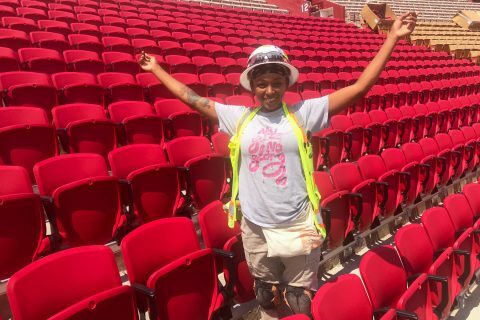 Brittany Brown has helped install some of the 12,300 new seats that have been installed at the Coliseum. She has no trouble being one of few women on the job. A Los Angeles native who lives just a few miles from the stadium, Brown is a working mom with a 5-year-old child. She started at the Coliseum early this summer. Her day starts as early as 6 a.m., and installing a new seat is not as simple as it may seem. 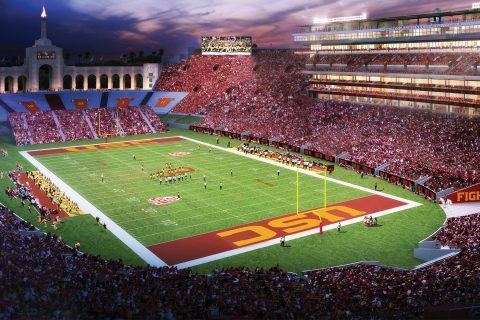 Every seat in the Coliseum is being replaced, leaving about 63,000 to go. Brown plans to stick around for most of the work. Huntington Park resident Nathan Strother enjoyed working in a barber shop before he decided to cut loose and make a big change. Strother is a construction wireman and a member of the International Brotherhood of Electrical Workers, local 11. He could be on the Coliseum job for as long as a year. 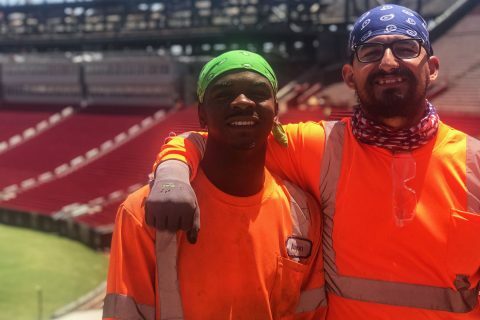 Aaron Beasley and Jaime Sandoval didn’t know each other when they started work at the Coliseum construction site in April, but they had a few things in common. They started the same day. 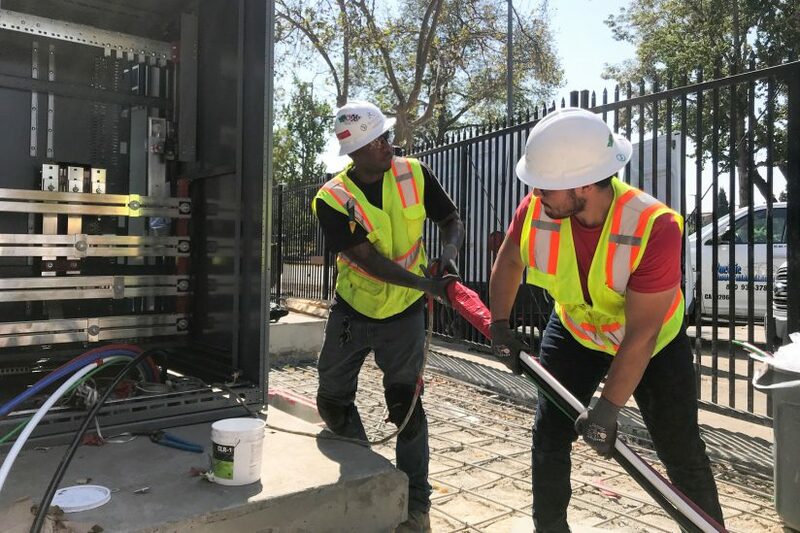 Both are Los Angeles natives who live within a few miles of the site, neither had experience in construction and both came to their jobs via the same path. My Brother’s Keeper is one of the community programs Hathaway Dinwiddie works with to bring local hires onto the site. 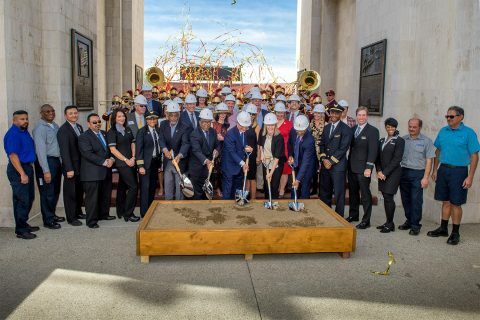 It wasn’t long afterward that Beasley got a carpenter’s apprentice job with Conco Construction, along with Sandoval, and the two became good friends. Both men see their union work as a key to the future. Sandoval and Beasley enjoy working at the Coliseum, feeling history all around them. They work side by side and often hang out. Not everything about them is the same. Beasley is a Rams fan; Sandoval prefers the Raiders. “I’ll drag him here to a Rams game, at least a preseason game,” Beasley said with a laugh. “Yeah, we’re friends unfortunately,” Sandoval said in deadpan fashion. 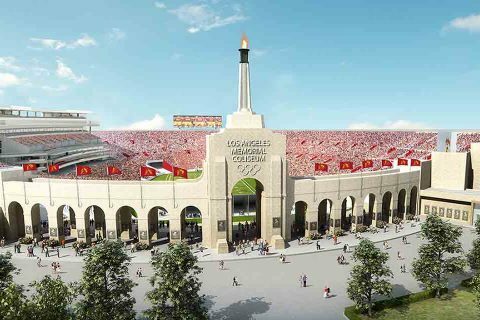 As the Coliseum construction and renovation passes the halfway mark, both men are looking back and forward.